Along with several government departments and agencies, the EPA was given a final opportunity to respond to the NSW Roads and Maritime Services’ Preferred Infrastructure and Response to Submissions Report (SPIR). 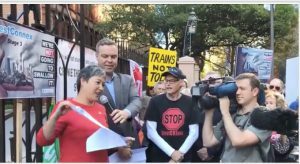 The purpose of the SPIR was to respond to thousands of criticisms of the Environmental Impact Statement (EIS) for the Stage 3 proposal to build a tunnel between St Peters, Haberfield and Rozelle. I received a copy of the EPA’s final advice through the EPA media’s office on Tuesday, May 8th. I made direct inquiries after I was told last Friday by a NSW Planning staff member that she had confirmed that the government departmental responses to the SPIR are never released and would not be released in this case. Following this advice, I wrote to a senior Planning Department officer Mary Garland, enclosing a link to where government responses had been published for the New M5 and requesting that the responses of the EPA and other agencies be published on the Planning website. I have neither received a response from Planning nor have the agencies’ responses been published. The Department’s failure to post the agencies’ responses follows the Minister for Planning Anthony Roberts’ secret approval of the Stage 3 EIS on April 17th. Mr. Roberts did not release his decision until the afternoon of Friday, April 27th, and was then not available for comment. CPB Contractors claim $1billion more from NSW government in huge cost blowout. Last week, the NSW Labor opposition last week released a secret letter between the New M5 CPB Dragados and Samsung consortium and Sydney Motorway Corporation which revealed that the contractors are claiming an extra $706 million to cover cost blowouts. The New M5 project, which was originally supposed to be completed in 2019 and then 2020, is now likely to be opened in 2021. Today, The Australian reported that the claims were for $1 billion dollars and that the contractors were blaming the government for "planning approval delays". As it is the New M5 approval was pushed through in the face of massive community opposition and hundreds of criticisms from community groups, independent contractors hired by the City of Sydney and other local councils and other government agencies. The Minister for WestConnex Stuart Ayres made light of the claims saying that WestCONnex was 'on time and on budget'. The problem is that while the government still sticks to the figure of WestConnex costing $16.5b, everyone knows that this is fanciful and doesn't include any cost blowouts, most legal and property costs or additional roadworks made necessary by the project. No one can know what a three level underground interchange of a type never before built in an urban area, will cost. 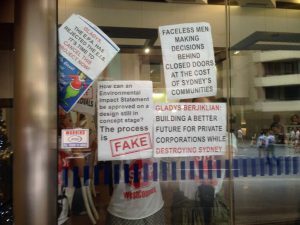 Corruption allegations, blow outs, prosecution, failure to respond to complaints - you would think it would be enough to put CPB well out of the picture for further major NSW government contracts. But this week Ayres announced that CPB Contractors with Lend Lease is one of two consortia shortlisted to design and build the Stage 3 approved concept. The two consortia are JCL Joint Venture (John Holland CPB Contractors Lend Lease) and SCS Joint Venture (Salini Impregilo Clough Projects Samsung C&T). Ayres described the process as " a rigorous evaluation" It seems that whatever rigor was applied did not include CPB Contractors failure to respond to residents complaints, problems with subcontractors an alleged breach of environmental law or serious criminal allegations against its parent company. 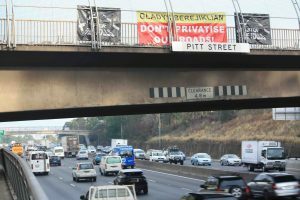 Protest Banners on M4 near Merrylands, May 2018.